Brick Mansions is a 2014 English-language French-Canadian crime-thriller film starring Paul Walker, David Belle and RZA. The film was directed by Camille Delamarre and written by Luc Besson, Robert Mark Kamen and Bibi Naceri. It is a remake of the 2004 French film District 13, in which Belle had also starred. 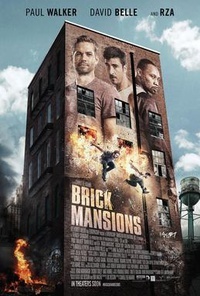 Brick Mansions was released on April 25, 2014, five months after Paul Walker's death on November 30, 2013 and has a dedication to him at the start of the credits. This is Walker's last completed film before his death but not his last film appearance. At the time of his death, he was almost done filming Furious 7 which was released on April 3, 2015. This webpage uses material from the Wikipedia article "Brick_Mansions" and is licensed under the GNU Free Documentation License. Reality TV World is not responsible for any errors or omissions the Wikipedia article may contain.